In the world of technology, having strong partnerships among vendors is key to the success of a project. Flextronics International (FLEX) is a leader in providing facilities and supply chain support to help its partners take their projects from concept to reality efficiently. They have trademarked this highly reputable strategy and called it the Sketch-to-Scale™ approach. The Singapore-based company operates in four different sectors: Consumer Technologies Group (CTG), High Reliability Solutions (HRS), Industrial and Emerging Industries (IEI) and Communications & Enterprise Computers (CEC). 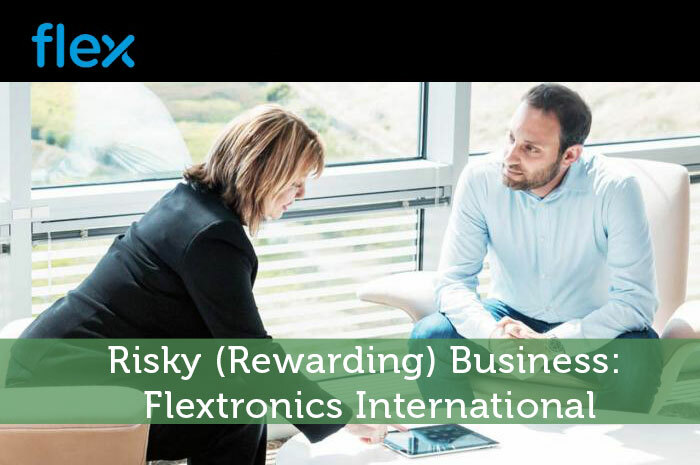 Flextronics International (Flex) provides tremendous incentive to its clients by having facilities and laboratories fully built out with the latest technology in 30 countries. Each of the sectors of the company has its own budgeting system and each builds custom facility for operations. Using the fully equipped facilities and trained experts from Flex makes partnership a balance sheet win for many start up companies lacking cash or financing. But this model has attracted more than just startups. Companies like Microsoft, Cisco, and Fitbit also partner with Flex to leverage its end to end production support. The Internet of Things (IoT) is a broad, relatively new sector of technology. IoT is simply a network of of electronic devices that are able to seamlessly communicate with one another. Many of the hardware, software and service providing IoT companies are still in their early stages. Flex is attracted to companies seeking to propel IoT technology to the next level of interest for consumers. For example, PointGrab has 30 million consumer electronic devices already available worldwide. Now they are looking to expand their proprietary CogniPoint™ sensors into business and retail buildings. These sensors are designed to collect analytics on building temperature, light/energy efficiency and secure the building leveraging this embedded technology. Also Flex partners with a healthcare focused IoT developer called HMicro. There is a strong case to bring IoT in the healthcare space as medical staff looks to monitor their patients both inside and outside the hospital. Wearable technology can provide data on patient vitals and can report results of patient treatments outside of the hospital. While in the hospital, a fully integrated IoT system could help schedule tests, learn about the patients comfort needs and give nurses cutting edge technology to observe their patients each day. Think of the kitchen of the future. A refrigerator that will notify you on your phone that you need more milk today or an oven that will let you know when your salmon has reached a certain temperature and turns itself off. Or imagine how your car would be able to communicate with your mechanic/dealer when you are close to needing an oil change or tire rotation. The world is full of technology. Now we have come to a time it’s important to make it all communicate effectively to for consumer benefit. Flextronics’ 2016 10-K showed a great deal of improvement in their operating cash flows. The cash from operating activities improved from $794.03M in 2015 to $1.14B in 2016. And showing that they are using their cash appropriately, their free cash flows also increased even after purchasing more equipment and property in 2016. That cash flow will be used in a continuous buyback program to return value back to the investors. It seems that spending is inherent to the business model Flex is trying to sustain. They have to spend in order to make sure they have state of the art equipment and critically acclaimed experts to provide for their partners. On the 2017 Q1 report, Christopher Collier, the company’s CFO, announced that despite operating in a slow demand market, they have seen a 6% increase in revenues year over year. Although the outlook for Q2 isn’t quite as strong, Flextronics believes Q3 and Q4 will be positive. This is a result of increase in sales during the holiday season for Flex’s electronics manufacturing partners. A significant portion of Flex’s business comes from outside of Singapore. About 35% of Flex’s profits come from China, followed by 15% profits from Mexico and 11% from the United States. As a result, Flex often exposes itself to many at risk companies. Companies that that have short product lifecycles, operate in the less stable emerging markets and companies going against steep competition are on the long list of Flex’s current partners. This also puts Flex at a higher risk to be unable to collect on it’s accounts receivables. For example, in the 2016 10-K report, Flex reported a bad debt charge for the bankruptcy of SunEdison. SunEdison had an open account which left Flextronics about $61M in unpaid receivables. This type of expense only decreases Flex’s cash flows, which is the opposite of what investors are looking for. The technology sector is evolving and I think IoT may be springing with life in the next 3 to 5 years. Flextronics has a unique position that leverages the opportunity to grow with first movers in the IoT space. I’m interested to see what comes out of their 2017 efforts. *Note that Flextronic International fiscal year ends March 31st.